Matteo is a born competitor. He is an avid hockey player. The hockey season was still in full force back in March of 2018 and Matteo had participated in every practice and played every game. But he started feeling unwell and displayed symptoms of fever, swollen belly, bruises on his legs and was constantly feeling tired. He was so unwell, in fact, that one day he called his mother from the hockey arena and told her “I need to go to the hospital”. A visit to the hospital did not uncover anything suspicious. It took several visits to the pediatrician’s office and naturopath before more tests were done. In May 2018, bloodwork and abdominal ultrasound were done. The lab called the following day and classified Matteo’s bloodwork as urgent. His spleen was enlarged and he was told to stop all physical activity and to head to the hospital immediately. A bone marrow aspirate confirmed a diagnosis of leukemia. The family was in absolute shock and began to absorb the information they were hearing. Matteo immediately started intensive chemotherapy. The treatment hit him hard and he suffered many side effects including: fevers, anaphylactic reactions to blood transfusions, nausea, severe jaw pain; and pancreatitis. Gradually, as Matteo gained physical strength, he also gained strength from the support he received from family, friends, his hockey team and other children he met who were going through the same procedures, tests, pokes and prods he endured. Matteo missed being on the ice and with the approval of his oncologist, head coach; and the assistant coach, (Matteo’s father), he began attending the summer hockey practices in July & August of 2018. It was difficult. He had lost strength and stamina from the medications and steroids but he persevered. Hockey kept his spirits up and gave him the strength he needed to keep fighting leukemia. He came home in tears because of leg cramps and pain throughout his body. His mother would massage his legs and arms and apply hot compresses, always so proud to see his will and determination. That fall, still in treatment, he participated in the games with his coaches and teammates cheering him on. An orange ribbon, labelled Matteo Strong 9, Leukaemia Awareness was sewn on all of the hockey jerseys on Matteo’s team. It was a very emotional moment for Matteo’s parents and his hockey community. Soon Matteo began to reach out to some of the other children he saw in the hospital who were upset and frightened and he began to tell them that things would get better. Matteo told his parents that he wanted to make a difference and help raise awareness and money for childhood cancer. 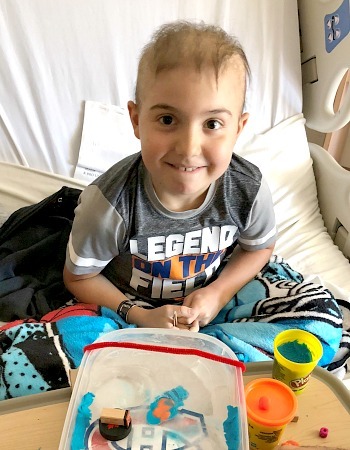 In January of 2019, Matteo entered a new phase of treatment called maintenance therapy. This entails three more years of chemotherapy, pokes, tests, lumbar punctures and scans. The journey far from over, but the fight in Matteo still strong. Maintenance is critically important as if not completed, there is a very high likelihood that the leukemia will return. Matteo now takes the majority of his chemotherapy orally, taking up to 18 medications a day depending upon where he is in the cycle. Every two weeks he goes to hospital to have either: chemo via his port; lumbar punctures in his spine on Days 1 and 29 of his cycle; and he has bloodwork done to monitor his blood counts.